Many people experience a strong dislike of everything crawling or slithering. While not everybody is afraid of spiders and snakes, clinical fears of these animals are among the most common types of specific phobia. These extreme fears can severely interfere with everyday activities such as taking a walk outdoors. Given that the risk of being bit and seriously injured by spiders and snakes is quite low in most regions of the world inhabited by humans, one may ask: Why are so many people afraid of snakes and spiders? Researchers in the 1970s already observed that clinical fears of spiders and snakes are astoundingly common. A plausible explanation seemed to be an evolutionary mechanism. Some scientists suggested that we have innate fears of animals that share a long evolutionary history with us and have been dangerous to our ancestors. Spiders and snakes have been around for 40-60 million years, thus fitting this argument. Others have argued that though we may not be innately scared of crawly animals, we might possess a specific preparedness to associate fear with them; in other words, we are born ready to rapidly learn the fear of spiders and snakes. In line with this argument, fear-learning experiments in humans and other primates produced stronger results when spiders or snakes were paired with unpleasant sensations compared to pictures of flowers or mushrooms. One limitation of this research has been that only human adults were tested. Thus, it was difficult, if not impossible, to rule out the effects of earlier learning experiences or cultural influences. This is why it is crucial to also conduct studies with preverbal infants who have limited prior exposure to spiders and snakes or cultural renditions thereof. If we want to know whether something is learned or hard-wired through evolution, young infants are our best informants. Preverbal infants, though, don’t easily give away their thoughts and feelings to inquisitive researchers. In order to find out whether infants are stressed when seeing spiders and snakes, we conducted an eye tracking experiment. This required infants simply to sit in front of a computer monitor and watch a sequence of pictures while their eyes were being recorded. Infants sat on their parent’s lap in front of the eye tracker. Parents wore sunglasses with opaque plastic covers so they did not see the screen and could not influence their babies. We showed a total of 48 6-month-olds pictures of spiders or snakes intermixed with harmless control images showing flowers and fish. While infants saw the pictures, we measured changes in their pupil sizes. Pupil size generally depends on lighting conditions. Under constant lighting, though, pupil size is an indicator of physiological arousal. More specifically, it is linked with activity of the noradrenergic system in the brain that controls the fight-or-flight response. 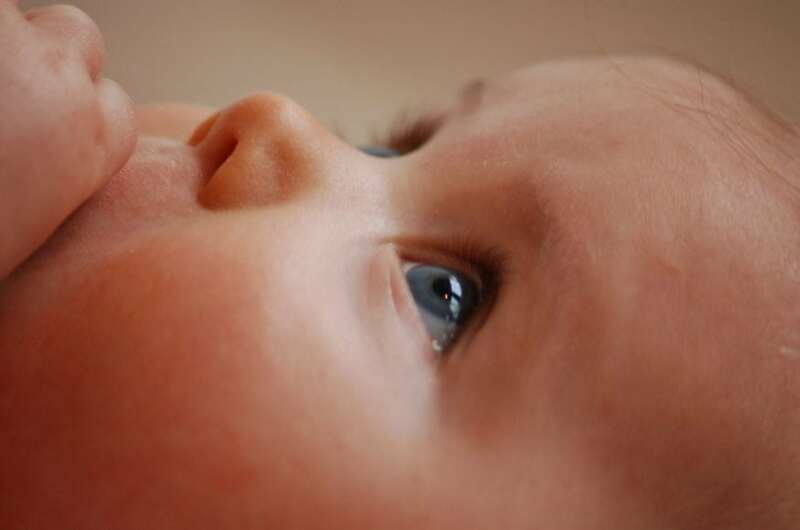 By monitoring infants’ pupil sizes, we can thus infer their level of arousal. When seeing a spider, infants’ pupil sizes increased compared to seeing a flower that was carefully matched for color, luminance, and size. Similarly, infants seeing snakes showed greater pupil dilation compared to watching perceptually matched fish. Thus, infants displayed evidence of increased arousal when watching animals that represent ancestral threats to our species compared to pictures of harmless flowers and fish. Though we cannot rule out prior experiences completely, these results speak to a stress-response to evolutionary threats that requires little, if any, learning experiences. Our results speak to an evolutionary mechanism at the core of specific fears of spiders and snakes. This does not necessarily imply that infants possess an innate full-fledged fear of evolutionary threats. In fact, somewhat older children do not seem to actively avoid these animals. And, after all, not everybody is afraid of crawly animals. Rather, an early occurring fight-or-flight reaction to spiders and snakes might make it easier to associate these animals with fear compared with other animals or plants that do not trigger the same evolutionary acquired reaction. If a spider or snake is then associated with a negative effect, for instance, through the expression of fear or disgust from a caregiver, this association is quickly learned and not easily dissolved. These findings are described in the article entitled Do infants associate spiders and snakes with fearful facial expressions? recently published in the journal Evolution and Human Behavior. This work was conducted by Stefanie Hoehl from the Max Planck Institute for Human Cognitive and Brain Sciences and Heidelberg University, and Sabina Pauen from Heidelberg University. Stefanie Hoehl is a professor of developmental psychology at the Max Planck Institute for Human Cognition and Brain Sciences. She is interested in the early development of social cognitive functions and social learning. She received her doctorate from the University of Leipzig in 2008.